You'll be £20.00 closer to your next £10.00 credit when you purchase Liberty's Provenance. What's this? The battle of the Atlantic, fought by the Allies to maintain lines of communication and vital trade routes for armaments, men and basic sustenance, could not have been won without the 2,710 Liberty ships that were designed and built for those critical one-way voyages to Europe – more than one voyage was considered a bonus. The kudos for the Liberty’s construction is, rightfully, American for that is where they were built. Less well understood is that the groundwork for the shape of the hull and its basic hydrodynamics took place in the North Sands shipyard of Joseph Thompson & Sons Ltd on the banks on the River Wear in Sunderland. This new book follows the path of the critical designs that flowed from Thompson’s shipyard commencing with SS Embassage in 1935, SS Dorington Court in 1939, through the SS Empire Wind/Wave series for the Ministry of War Transport in 1940 to SS Empire Liberty in 1941. These led to the sixty Ocean Class vessels built by Henry J Kaiser and, from these, the Liberty ship was adapted by American naval architects Gibbs & Cox who, to this very day, still claim they designed the Liberty ship. With the use of beautifully drawn ship profiles, starting with World War I designs, then the critical designs from Thompson’s shipyard, and particularly a drawing comparing the Liberty ship with its British progenitor, the author demonstrates just how much of the former was borrowed from the latter. While some credit has been given to Thompson’s designs this new book offers the first real proof as to the direct link between his work, the Empire Liberty/Ocean Class and the Liberty ship which followed. 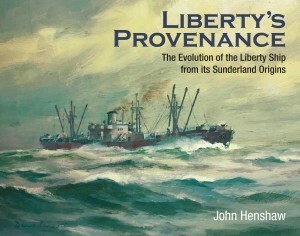 In addition, the book demonstrates the versatility of the Liberty ship and explores those that were developed for specialist use, from hospital ships and mule transports to nuclear-age missile range ships. A fascinating and beautifully presented book for all those with an interest in the battle of the Atlantic and, more specifically, in one of the most important ship designs of the War. JOHN HENSHAW is a retired chartered surveyor, educated at Wesley College and Melbourne University. He spent most of his working career designing and constructing buildings of all types from domstic houses to office buildings. He has always had a love of the sea and owned several yachts, cruising Australia’s North East Coast extensively. He is also an accomplished marine watercolour painter and ship modeller and a fine technical draughtsman. His beautiful linework is a highlight of this book.